Magnet tool holders are designed to sturdily grip metal, installing in your garage, shed, wood shop, kitchen, office, anywhere you can mount into a wall (Instructables). 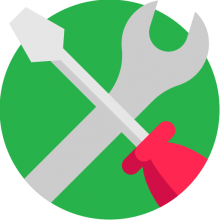 You can mount a ton of different things- screwdrivers, wrenches, hammers, spanners, extensions, ratchets, saw blades, pliers, knives, sockets, fasteners, scissors, screws, scotch tape dispensers, ammo magazines or any other kind of metal object (Listotic). How long is the magnetic strip? How does it install (flush-mount and/or brackets)? Can you connect multiple magnetic strips? This 24" magnetic tool holder is designed to efficiently organize your tool shop- each magnetic strip can hold 20 lbs. per inch. And its mounting holes are spaced 16" apart. One buyer we spoke with said that it accommodates 12 different pliers. Another buyer told us that you can mount them next to one another to make a super-long magnetic strip, or even lay them out parallel, a couple inches apart, to make the magnetic grip super-strong. One small thing to note, the strip is not a single, long magnet, but rather several magnets that are affixed between the grip of the steel bars. Let's take a look at 5 of the best magnetic tool holders on the market today. 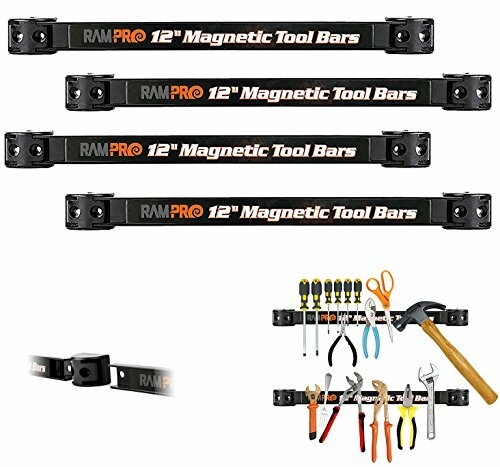 The RamPro Heavy-Duty Magnetic Tool Holder Rack 4.3 $ 12"
The GoPlus Magnetic Tool Holder Organizer 4.7 $ 18"
The Master Magnetics Tool Holder 4.8 $ 24"
The Industrial Tools Heavy-Duty Magnetic Tool Organizer 4.2 $ 12"
The Capri Tools Magnetic Bar Holder 4.2 $ 12"/18"/24"
These heavy-duty magnetic tool holders offered by RamPro are well-built, reliable, sturdy and an excellent choice for organizing your tools. Users love that the racks are easy to mount, but some do note that they are short. Each of the four RamPro magnetic bars measures 12 x 1 x ½ inches, and it weighs 1 lbs. A single rack can hold tools up to 5 pounds. The magnetic tool racks have a solid steel frame with a black gloss finish, and you can install them on a wall or a work table. The package includes eight mounting brackets and eight mounting screws 1-3/8 inches in length. In general, users have a high opinion of the RamPro four heavy-duty tool holder racks, and they praise their performance and practicality. A buyer comments that the magnet holds his tool securely and that he doesn’t worry that they are going to fall. The reviewer adds that the rack is ideal for heavy hammers and wrenches and that it saves him time looking for a particular instrument. Another user shares that he uses them to secure his firearm magazines in his gun safe and that he is completely satisfied with the quality and sturdiness of the magnetic tool boards. A purchaser mentions that these magnetic holding racks are a perfect Christmas gift and that he highly recommends them. However, some customers have complained that the RamPro stickers on the magnet holders don’t come off and that you have to spend a couple of hours to remove them. If you are looking for a top-notched magnetic tool organizer, you might take a look at this magnetic strip for walls offered by Goplus. Users love the sturdy construction, but some do note that there are no magnets on the back to hold the rack. Each magnetic holder measures 18” x 0.9” x 0.49”, and it weighs 1. 58 lbs. The package includes six magnetic bars, and you can use them to store knives, scissors, tools, or even keys. The weight capacity for each bar is 22 lbs, and they are an excellent choice for saving counter and drawer space. A customer comments that the magnetic strips are so good that the bought another set and that it holds heavy tools with no issues. The reviewer adds that it’s easy to mount the tool holder and that it’s perfect for kitchen knives. Another user shares that he hung ten large wrenches and that they didn’t move an inch. He highly recommends it as the best magnetic tool holder available. A purchaser states that the tool organizer is made of durable material and the magnet is strong and reliable. He says that it’s an excellent gift for every handyman. However, some customers have complained that the magnetic boards are not suitable for heavy-duty tools and that the magnet should be stronger. A buyer warns that something bigger than a standard screwdriver will slip off the racks. 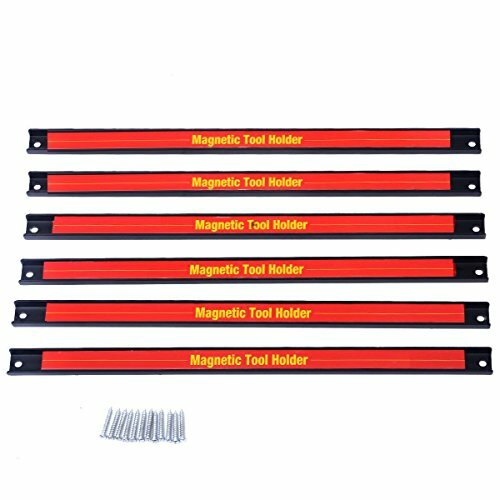 This 24-inch magnetic tool holder offered by Master Magnetics is strong, reliable, efficient and a product of high quality and design. Users love that the magnet strip is easy to install, but some do note that it’s expensive. 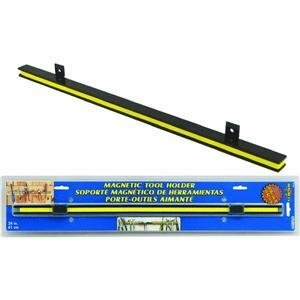 This Master magnetic strip for walls measures 27.8” x 10.8” x 6.5”, and it weighs 1 pound. The magnetic bars can hold up to 20 pounds per inch, and you can mount it on a wall or a workbench. The package includes all the necessary hardware. Overall, this is an excellent tool for holding and organizing tools in the garage or the workshop. As a whole, customers are extremely satisfied with the Master magnetic tool holder, and their praise its construction, design, and functionality. A buyer comments that he was skeptical whether the magnetic rack would work for him, but he managed to fit ten different pliers and channel locks. Another user shares that this is the strongest magnetic rack that he has ever owned and that it holds heavy tools with no issues. The reviewer adds that the magnetic holder is easy to install and that he would gladly buy another one. A purchaser says that the tool organizer holds a two-pound hammer and that it’s the best choice if you want to save some work space. However, some customers have complained that the tool holder is not a full-length magnet and that it’s not strong enough for them. Some users also complain that the product they received didn’t match the provided description. This heavy-duty magnetic organizer offered by Industrial Tools is reliable, efficient and convenient for saving space in your workshop. Users love the price, but some do note that the company’s sticker is hard to remove. The package contains four magnetic strips, and each of them measures 12 x 1 x ½ inches with a weight of one pound. Each bar can hold several individual tools up to 5 lbs, and it has a solid steel frame with a black gloss finish. You can either flush mount it or use the mounting brackets. A buyer comments that he connected two of the magnetic bars and that they can hold tons of pliers, cutters, screwdrivers and hand wrenches. The reviewer states that the magnetic holder is ideal for every workshop, but he doesn’t recommend it for kitchen use. Another customer shares that this is the best magnetic organizer that he has ever encountered and that the magnet is exceptionally strong. He adds that it’s easy to mount the magnet bars and that there is no hand tool that the rack can’t handle. A user also states that he likes the two mounting options and that he highly recommends this magnetic tool holder. However, some customers have complained that the plastic coating starts to peel off quickly and that the magnet organizer can’t hold heavy tools. Some users also note that the package arrived missing the necessary mounting hardware. 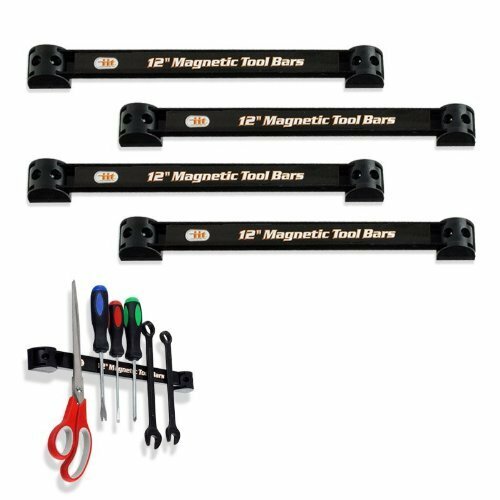 If you need a reliable magnetic bar tool, you might take a look at this magnetic holder organizer offered by Capri Tools. Users love the strong magnet, but some do note that the product they received didn’t match the provided picture. The magnetic tool rack measures 24” x 1” x 0.5” inches, and it weighs 2.1 lbs. The magnetic rack is made of a solid steel frame with a black powder finish to prevent scratches. It can hold several individual tools up to 5 pounds each, and it’s easy to install it with two ¼ inch mounting holes and provided screws. A buyer comments that the magnetic rack is holding nine screwdrivers, three chisels, two hammers and a 2-lbs sledgehammer with no issues. He says that he was worried at first that the tool might fall off, but the magnet is exceptionally strong and that the provided screws are heavy-duty. Another user shares that he mounted the magnetic rack near his lathe and that it’s well-made and sturdy. A happy purchaser adds that it takes minutes to install the magnetic strip and that it’s very useful for kitchen knives. However, some customers have complained that they expected the magnet to be stronger and that there are dead spots present. Some also note that the screws and the anchors for mounting should be better designed. The first magnetic tool holder rack we examined was the RamPro. The manufacturers market their magnetic tool holder as an efficient and easy way to keep your most commonly used tools organized and on hand, whether you have a garage, basement or more high-end tool shop space. The RamPro ships with 4 individual magnetic tool holders that measure 12" x 1" x .5", weighing 1 pound in total, and equipped to hold up to 5 pounds each. They are built from solid steel frames and the magnets grip strongly to metal. Another handy feature is that the strips can actually be connected together using the adjustable mounting hardware. Installation requires you to either screwed it onto the wall or flush mount it. When you purchase, you will receive four magnetic bars, eight mounting brackets, and eight mounting Phillips screws. The manufacturer says that some of the top benefits of purchasing a magnetic tool holder rack is that they are a convenient and often overlooked a means of organizing your workbench, working as magnetic wrench holders, magnetic strips for knives, magnetic file holder, and as a general-purpose heavy-duty magnet strip. It's a simple means of keeping commonly used tools immediately at hand, can't be employed in kitchens to hang up kitchen implements like knives, and they can also be used to hold ammo magazine stacks if you are a rifle or a gun owner. One buyer we spoke with told us that it was an essential means of organizing his firearm in magazines inside of his gun safe. Another reviewer told us that he uses them inside of his large tool chest to magnetically capture screwdrivers, bolts and a variety of other nuts. The only complaint these magnetic tool holder racks seem to accrue is that UPC stickers are often attached to them, and these are difficult to remove, often leaving unsightly sticker residue and sticker skin on the magnet itself. The second option we reviewed was the GoPlus 18-inch magnetic power tool holder- the manufacturers say it is an ideal means of organizing your tools, knives, scissors, home keys and even children's toys. It measures 18" x .9" x .49", weighing 1.58 pounds with a 22 pound weight capacity for each bar. GoPlus sats that the magnets run the entire length of the bar. One buyer we spoke with said that if you're looking to hang very heavy items from these GoPlus magnets, you can actually run two of these magnetic tool bar strips parallel to each other a couple inches apart and that way you double the grip strength of your tool holder. Another reviewer told us that in his experience some novice users are unaware of that the back of these power tool strips is not magnetic- you will need to either nail or screw them into a hanging space in some way or another. Yet another reviewer told us that he employs these magnetic tool strips inside of a shed and he angles them so that tools of different heights can all fit on his wall. The third option we looked at was the Master Magnetics tool holder- it is a 24-inch option that the advertisers say can hold up to 20 pounds per inch. One satisfied the buyer told us that this magnetic tool holder is able to hold most of his tools, pliers, and wrenches, for the most part, though they work more effectively on tools that have flat surfaces rather than those that have rounded elements. Buyers say that it effectively mounts on 16-inch center holds, providing an effective but simple means of storing and organizing tools in your workshop. Indeed, many buyers describe the hassle of storing some of their more commonly used tools inside of tool chests and having to rummage through a bunch of junk to find them when needed- these tool racks ensure that those frequently resourced items are always on hand and available for use in a pinch. One buyer does say that this is not a single 24-inch long magnet, but instead several magnets that are mounted between the two steel bars of the tool holder. The fourth option we examined was the Industrial Tools 12-inch magnetic organizer rack-they market it as the easiest means of keeping frequently used tools within easy grasp. They install with 3/16 inch mounting holes, using either brackets or flush mount installation methods. They include mounting brackets that are positioned that either end of the tool rack that holds the magnetic surface slightly off the installation surface. One buyer says that these are strong options that he uses to hang his rulers and chisels, but he does complain that the manufacturer thoughtlessly left adhesive stickers on them that were near impossible to remove without leaving an ugly and unsightly spectacle on the surface. Some users who don't like the color of their tool holders or are plagued by the sticker issue often tape over those unsightly elements to ensure that their workshop decor is not upset. 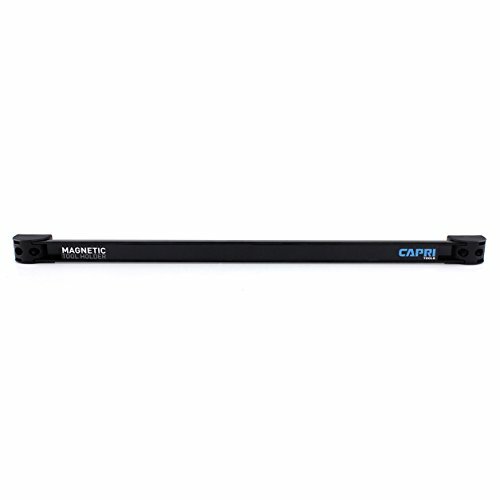 The last option we looked at was the Capri Tools magnetic tool bar holder- it comes in 12-inch, 18-inch, and 24-inch lengths. One buyer, on the market for the best magnetic tool holder, who purchased the 24-inch option says that he was easily able to hold a variety of power tools, wrenches, knives, flashlights, brooms, screwdrivers, chisels, hammers and even a sledge onto this magnetic bar holder tool. You'll want to ensure that when you screw it into the wall, if that is where you are hanging it, that it inserts into the support studs so that it will bear all of the weight you will be loading it with. It does ship with sheetrock anchors, but some buyers were skeptical that the sheet rock anchors would be able to support the weight of all the tools you'll probably end up hanging from it. Another reviewer told us that he ended up purchasing longer installation screws because the screws that were included to mount it on the wall were not long enough to provide the needed weight support, he thought. Other buyers who have a history of purchasing these magnetic tool holder racks, says that this is, in fact, the strongest option they have seen for sale, whether from Home Depot, Harbor Freight or other local-area tool stores. This same reviewer told us that while he is overall happy with what he has received, he does say that the mounting holes were not coordinated the way he would've liked- specifically they are not centered well enough, making it difficult to hang them up onto pegboard. Overall, buyers told us but this was a above average option, enabling them to hang up tools in their garage and let them grab hammers or screwdrivers as needed, especially when they required them quickly.